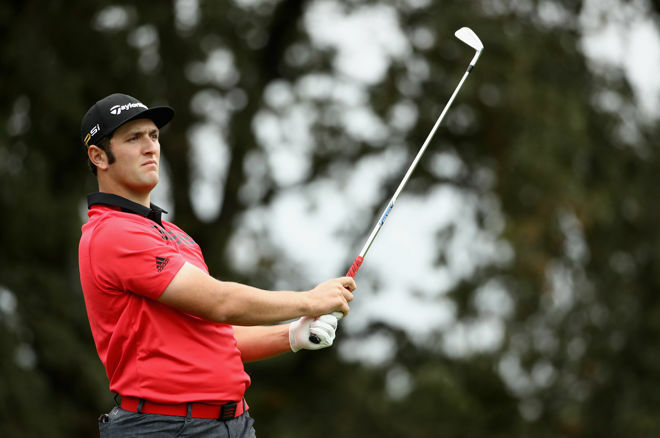 Jon Rahm leads our top #DraftKings plays for the DEAN & DELUCA Invitational. The Dean & Deluca Invitational is played at Colonial Country Club in Texas, and once again we come into a Par 70 course as it plays fairly short at around 7,200 yards. With this being an invitational, the field is limited, although the top 70 and ties will still make the cut on Friday. In events like this, we feel picking high upside players is better than picking your normal punt plays on DraftKings. An easy way to do this is limit yourself to two stars at the most and balance your lineup with players above $7,000. We aren't saying a player under $7,000 wont crack the top 10, but it is a reach. Golfers will play only two Par 5s per round this week and only one of them is reachable in two. The longer Par 5 plays at 635 yards and yielded zero eagles last year. Only one player will likely try to go after this green, and odds are he will finish dead last in this event, so it really doesn't matter. Most players will be laying up to that magical 100-125 yardage so looking at players who can hit their wedges close should give you a couple close birdie looks on the 5s (players will likely be hitting to this yardage on three Par 4s as well). If it weren't for his lack of course history, Rahm would be the runaway favorite this week. This will be his first time playing at Colonial, so we won't hold it against him. Ownership has been very hard to predict this year, but this week Rahm will likely be the highest-owned golfer on DraftKings. Fading chalk has worked well this year but we aren't sure you can fade this chalk. He has climbed up to 12th in the OWGR and may be the fastest to reach the top 10 in some time. Rahm's stats this season are off the charts. He ranks 14th in BA, 4th in BoB%, 14th in GIR, 2nd in Par 4 Scoring and 2nd in T2G. Rahm is coming off a surprising MDF at The Players, which was surprising as we felt he was one of the first timers who had a chance to contend. He shot his worst round of his short tour career on Saturday – an 82 — so we will see what kind of mental game Rahm has this week in a rebound effort. My wife and I got the pleasure of being ambassadors for Nike for the 2015 Valero. We got to walk inside the ropes with one of the lead groups. My wife, one month after having twins, was a trooper and footed the long hike of 18 holes. The group chosen for us was Kirk, Brendan Steele and Zach Johnson. Each of these guys was very courteous to us, always asking us for water or energy drinks and they even chatted with us between holes. After play, Johnson and Steele signed a used ball for my son but Kirk bolted without saying anything after posting a top 10. His caddie told us he had to hurry up to get to the next tournament. I made a rude comment on Twitter about the ordeal as I felt he was just upset after blowing some shots on the back nine. The following week I did not see his name in the field so I did some digging. He didn't want anyone to know a family member was sick so he was skipping the event before the Masters to be with them. I retracted my rude statement on Twitter and apologized. I even got a reply from him. Next time you feel the need to post something rude about a player, do your research and make sure you aren't the one being rude and inconsiderate. So, yeah, we like Kirk as a person and as a DFS pick this week. In his last three starts at Colonial, he finished no worse than 15th and also bagged a win. He has been hit or miss this season but is looking to keep his momentum after his best finish of the year: T12 at The Players. Kirk is phenomenal on the Par 4s, ranking 13th this year in Par 4 Scoring, and he dominates the approach yardages we are looking at this week: 16th in Approaches 100-125 and 11th in Approaches 150-175. Don't worry, there is no long personal story for this one. Stroud placed eighth in the Puerto Rico Open and followed that with four straight missed cuts. He will be looking to bounce back at a course he absolutely loves. The Texan has placed in the top 14 in four of his last five tries at Colonial. He ranks very high in some of our key stats this week: 21st in BA, 19th in GIR, 21st in Approaches 150-175 yards, and 53rd in T2G. Another thing to note: Stroud has been dropping strokes with his putter lately. Since the beginning of the year, Stroud has shaved 1.1 strokes in putts per round, going from 30.54 to 29.44. Stroud is just a minor putting tweak away from really catching fire and what better tournament than one where it looks like he knows the greens as good as anyone. Stroud needs to get off to a hot start as he has recently shot himself out of the cut on Thursday only to make a great comeback Friday to miss by 1. If he makes the weekend, he isn't scared to take it low. If you want to go stars and scrubs with your lineup this week, also have a look at JT Poston, Patton Kizzire, and Cameron Percy as low-salaried value plays.